Our top picks for most delicious and outrageous Purim treats this year. How can Purim go by without a rundown of the craziest, most crave-inducing hamantaschen that have hit our social media feeds this year?! The hamantaschen I’ve been seeing are using lots of different doughs other than a traditional cookie dough, which is such a fun and delicious take on the traditional triangle treat. 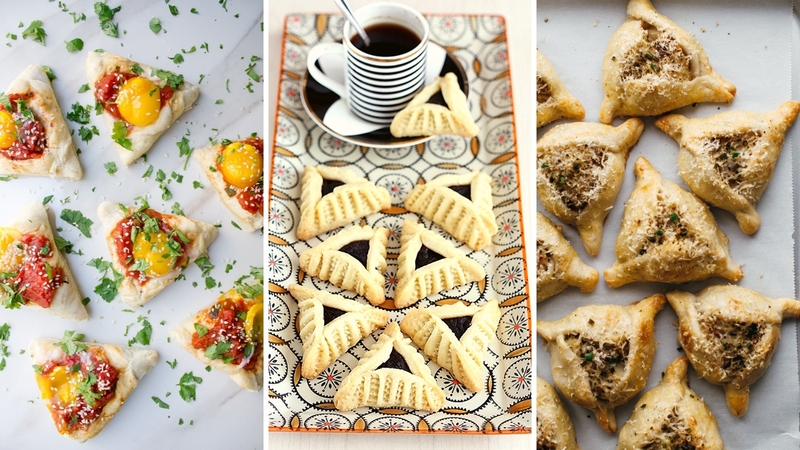 Savory hamantaschen are becoming more and more commonplace, and the sweet combinations we are seeing from bloggers and bakers all over the world are using plenty of creative license to pull inspiration from diverse culinary traditions. Food Network star Molly Yeh’s pregnancy cravings benefit us all with these salty, savory knish-meets-hamantaschen hybrid of deliciousness. Get her recipe for salt & vinegar knishentaschen. Ma’amoul is a classic Middle Eastern cookie, commonly found in Lebanese, Egyptian, and Syrian culinary traditions, which is stuffed with sweet date and nuts and made with a special mold to create an intricate exterior. This mash-up is breathtaking and unique. Get the recipe on The Cookie Fairy here (though fair warning, it’s in Hebrew). I want to throw a brunch cocktail party just to serve these savory bites from Amy Kritzer of WhatJewWannaEat. Get the recipe for shakshuka hamantaschen here. Mandylicious challah never disappoints with unique carb creations that inspire us to unbutton our jeans or slide on some sweatpants. These will send you right back to the foodcourt. Check these out on her Instagram page. This recipe from French-trained pastry chef Paula Shoyer is pure genius since the dough for éclairs, called choux, can be piped into any shape. No pinching required. Get the recipe for eclair hamantaschen here. Header image photo credits Amy Kritzer of WhatJewWannaEat.com, Molly Yeh of MyNameIsYeh.com and The Cookie Fairy Blog. Five places in NYC that make incredible coconut macaroons for Passover. From kimchi to mac and cheese, people are desecrating the sacred bagel.